Celebrating a Birthday Review ~ A perfect fit … 8 out of 10! Cover Art: The same graphics grace the cover as episodes 1 to 7. I like the background color and the font that was used for the title. Main Characters: Clay and Aiden are a married alpha and omega couple, who are expecting twins together. They have grown a lot from the beginning of the series to now. They moved from complete strangers to committed lovers. These characters have a lot of passion and love for each other. Secondary Characters: They give the story lighter moments. The author is really good at writing children’s dialogue. 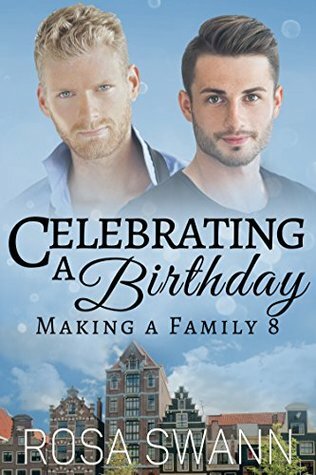 Plot: Aiden and Clay are celebrating Aiden’s birthday amid preparing for the impending birth of their twins. I liked the plot because it was rather straightforward. The story was easy to follow. Format: This episode continues previous alternating first person narrative. I liked being able to see the episode from both men’s perspective. Flow/Continuity: I think that this episode fits perfectly into the series. The characters have not changed negatively. They continued their growth from the last episode. There were more passionate scenes than in the last episode and the intimate scenes between Clay and Aiden were more satisfying. Conflict/Climax: This episode of Making a Family did not seem to have a conflict. There are still lingering issues regarding the brother in law. Conclusion: I liked this episode more than the last because even though it still felt like filler, the men had more couple time. This felt like a romance again and the previous episode did not feel that way. I liked how the author wrote the dialogue especially the children’s dialogue. For all these reasons, I give episode 8 a score of eight out of 10 stars! Previous Stephan’s Monster Review ~ Worth reading … 9 out of 10! Next Felix and the Prince ~ Review & Blog Tour … 10 out of 10!